Chicago-Style deep dish breadsticks are the easy version of fan-favorite Chicago style pizza. 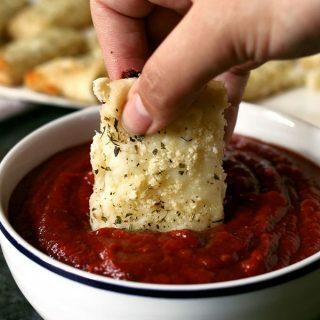 Dip them into your favorite pizza sauce for a fun appetizer or game day snack! I don’t enjoy deep dish pizza. Stop the presses. I am sure I’m breaking some unwritten rule as a life-long Chicagoan. Chicago-style thin crust, cut into squares is more my thing. 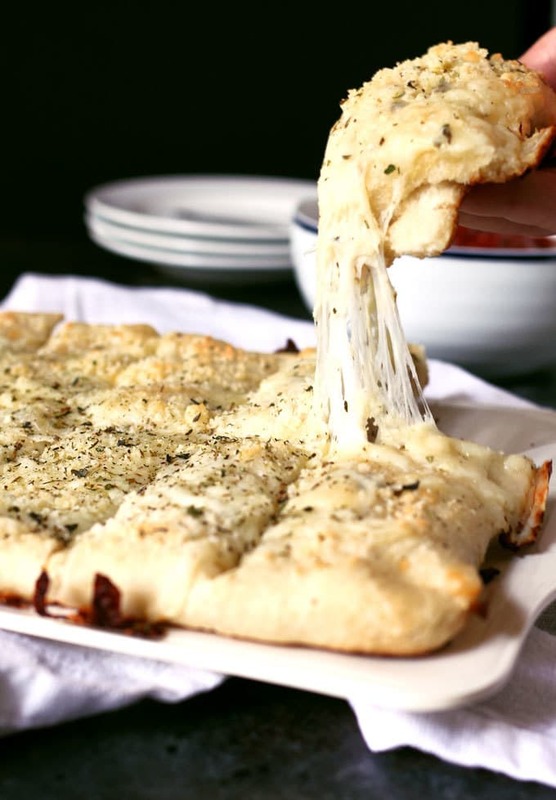 Those layers are what I’ve used as my inspiration for these cheesy breadsticks. Start with your favorite pizza dough. You can make it from-scratch or buy it at the store. Roll out the dough so it is in the shape of a long rectangle. Then fold it on top of itself so you have a two-layered rectangle. Place it into a high sided pan, pressing the sides of the dough up against the pan. Brush a mix of melted butter, garlic and Italian seasoning on top. 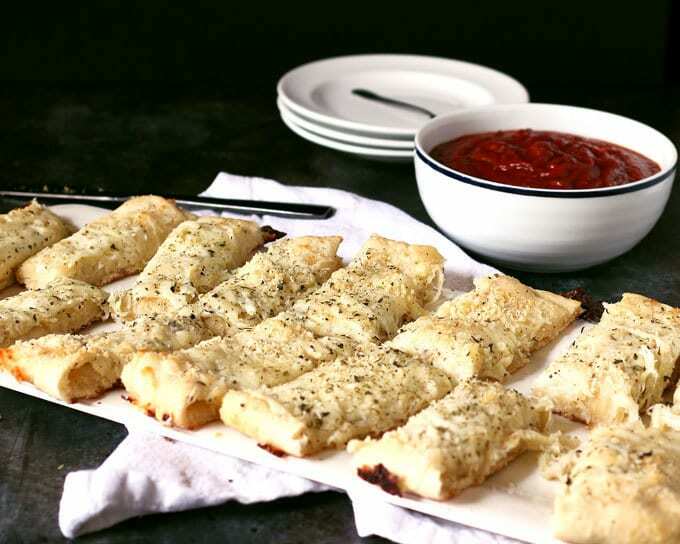 The flavors and smells of this alone will have you craving your pizza dough breadsticks to be done as soon as possible. Time to pop it in the oven for a quick cook. This will be about half the total cook time. 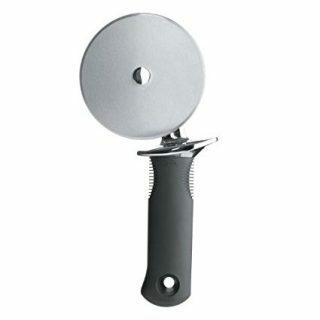 When you remove the pan, use a pizza cutter or knife to cut the dough into breadsticks. I like a long cut down the center and then slices on the horizontal side. Pile on the cheese and a little more Italian seasoning. I can never get enough of either. 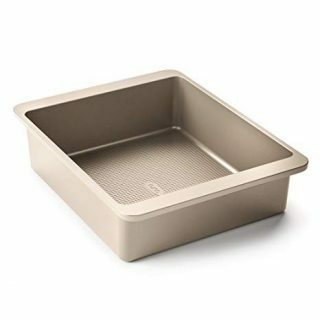 Place the pan back in the oven and finish baking. When you remove the breadsticks from the oven, you will be left with a thick, doughy and cheesy masterpiece. Serve it with your favorite pizza sauce and you’re all set for game day! 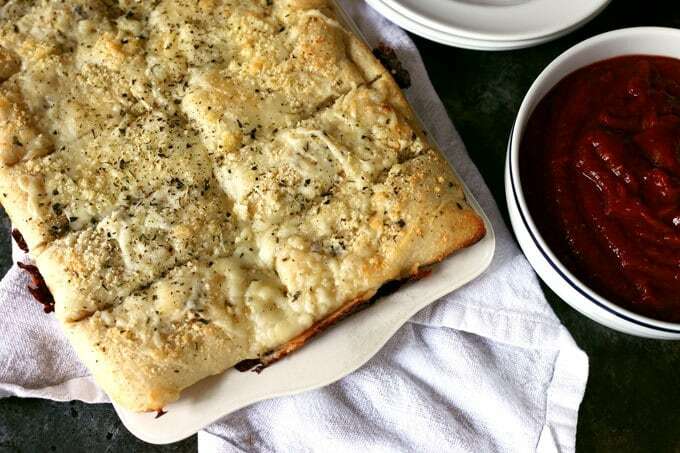 Chicago-Style deep dish breadsticks are the easy version of fan-favorites Chicago style pizza. 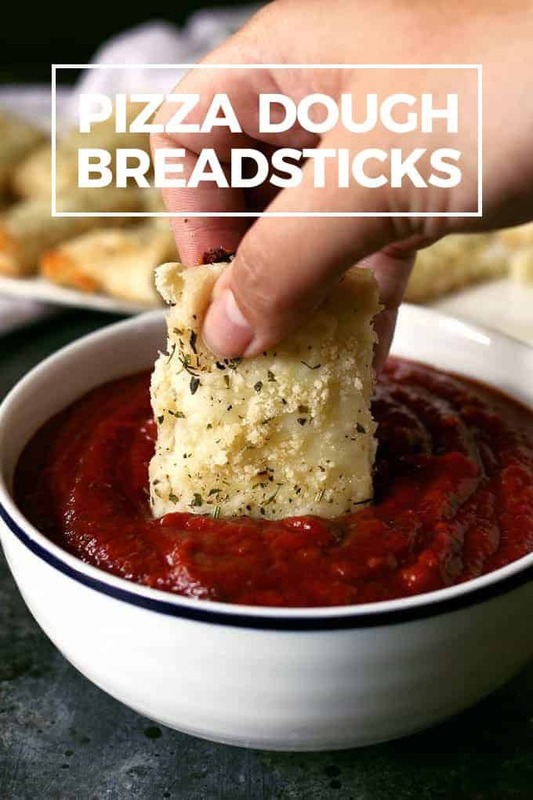 Dip them into your favorite pizza sauce for a fun game day snack! Pre-heat oven to 400 degrees F. Spray a 8 x 11 tall sided pan with non-stick cooking spray. Shape the pizza dough into a long rectangle shape. 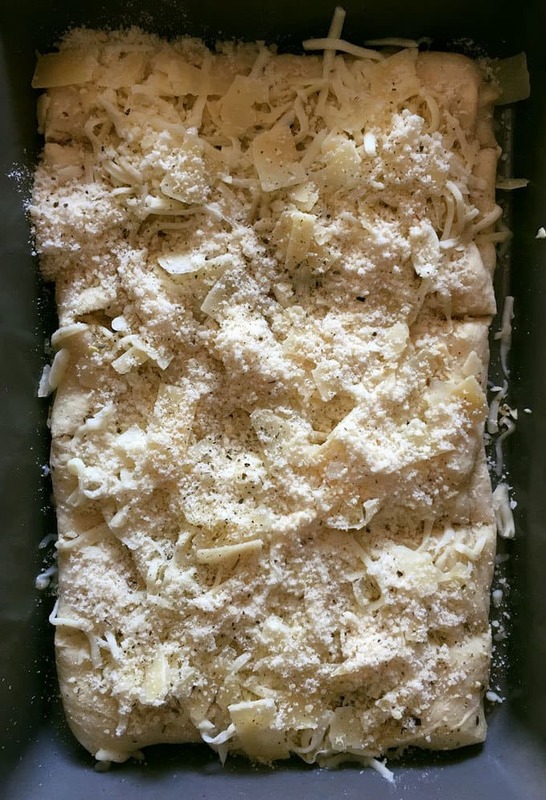 Fold the dough in half, into a smaller rectangle. Place the dough in the prepared pan, pushing the crust up against the sides of the pan. In a small bowl, combine the melted butter and garlic. Evenly brush the combination onto the pizza crust. Place in the oven for 8 minutes, then remove. 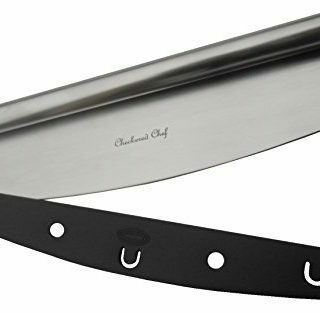 Use a pizza cutter or a butter knife to cut the dough into breadsticks. 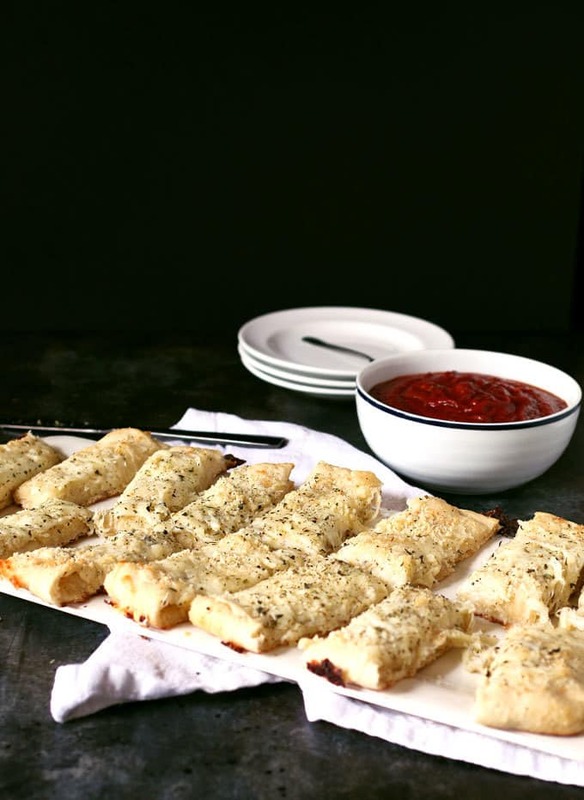 Sprinkle the mozzarella, Parmesan and Romano cheeses evenly across the breadsticks. Place the pan back in the oven, for 6-8 minutes, or until the top is browned and crispy. Remove from oven and serve with pizza sauce. 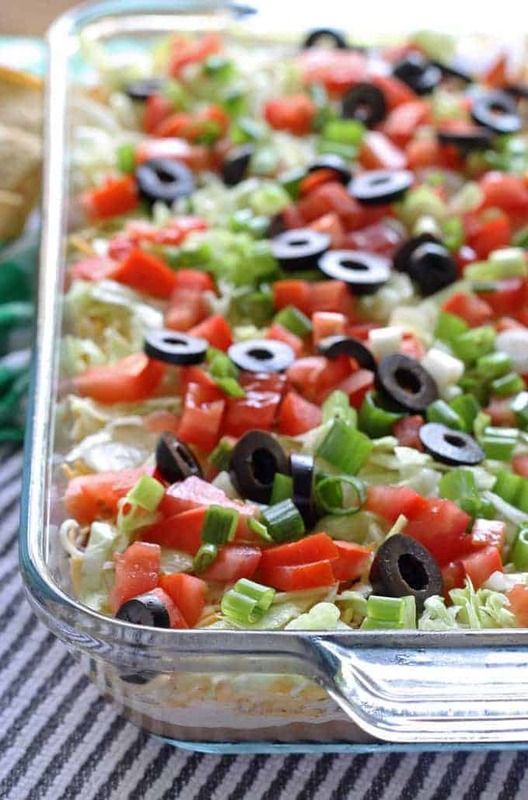 Try my eight layer taco dip! 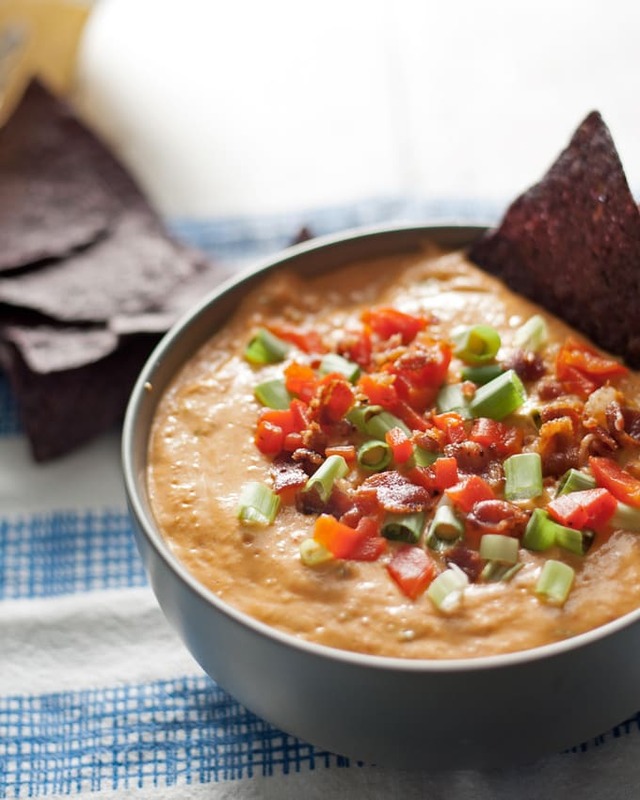 Or this pimento cheese dip! i love using my bread machine and set on dough cycle and this is a perfect way to use it! O.M.G…that looks heavenly! Thanks for linking up to the Creative K Kids’ Tasty Tuesday! Simple dishes are always the best ! Thank you and have a pleasant day !